Dice meat, chop onion. Grate eggs, beetroot, carrot in separate plates. Put glass in the middle of plate (I had only can). Press all layers with fork well. Remove glass. Smear salad with mayonnaise. 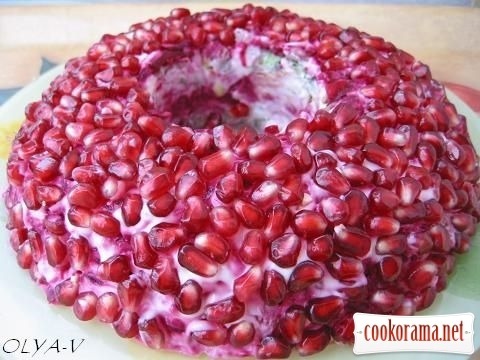 Pressing the top, sprinkle with pomegranate seeds.Put salad in the fridge for few hours. Top of recipe "Salad "The Garnet Bracelet""
Recipes, Vegetable salads, Salad "The Garnet Bracelet"